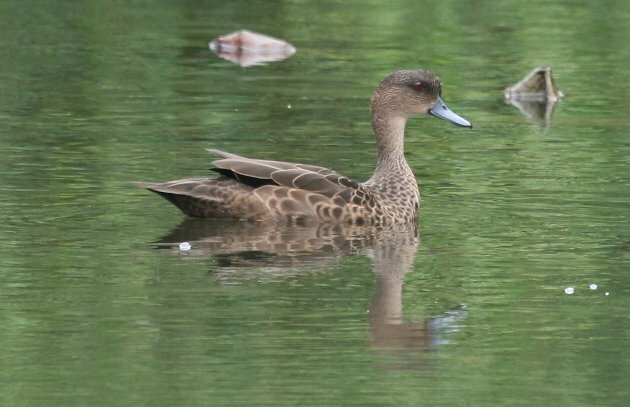 The Sunda Teal is a brown duck. This may make it very popular amongst European birders who can relate, but it doesn’t make it much of a deal within such an illustrous group as the dabbling ducks. 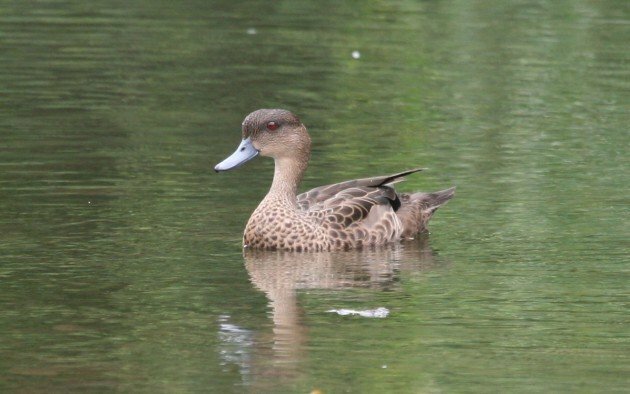 There is one thing however that makes the Sunda Teal a rather highly desired species, and the name is a bit of a give-away: the species’ magic is in its range. 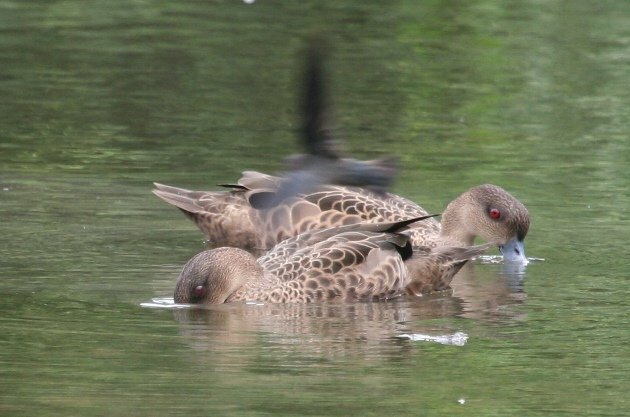 The Sunda Teal is restricted to the region of the Sunda islands, ranging from the southern halves of Sumatra and Borneo through Java and Sulawesi all the way to Timor. Now, “restricted to the islands of…” does not sound very extensive. 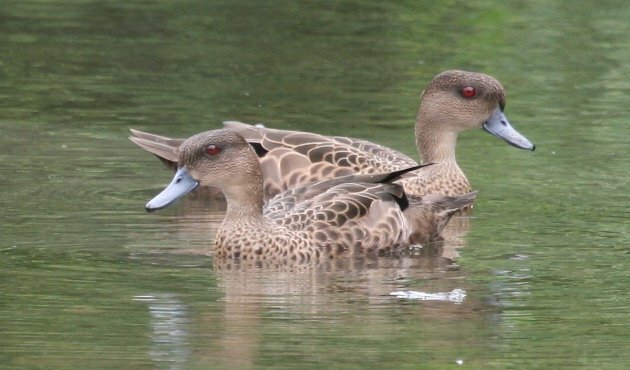 However, the Sunda islands span over a large region, and if the teal’s range is projected onto North America, it covers the area between Los Angeles and the panhandle of Florida. Within this range it uses all kinds of wetlands – including mangroves and even the sea on rare occasions – but is not easily found by visiting birders, who mostly rely on seeing small groups or pairs at a few more or less reliable and easily-accessed birding hot spots. One of these hot spots, and the most unlikely of all the birding hot spots in the world, is a small mangrove reserve called “Muara Angke” in the heart of Jakarta. This is where I saw it during a short visit last year, and where I hope to find it next weekend in the opening hours of my next visit to the region (I’ve got to beat Corey again somehow). It was during this visit last year that I noticed another interesting aspect of the Sunda Teal, one with the pontial of changing the course of human history more than the advent of digiscoping or the invention of the wheel: the Sunda Teal holds the key to defeating – once and for good – all of humanities diseases and pests, for the species’ immune system must be the most effective of any living creature. Ever. What you need to understand is that it lives and thrives in Muara Angke, and that Muara Angke is located at the mouth of a river that runs through Jakarta, an area where approximately 10 million people make a living on 650 square kilometres, which translates to 15,000 people / km²! Now, for comparison’s sake, New York City has around 8 million people on 800 square kilometres, or 10,000 / km². New York City also has a functioning waste disposal and sewage water system. Jakarta has its rivers. 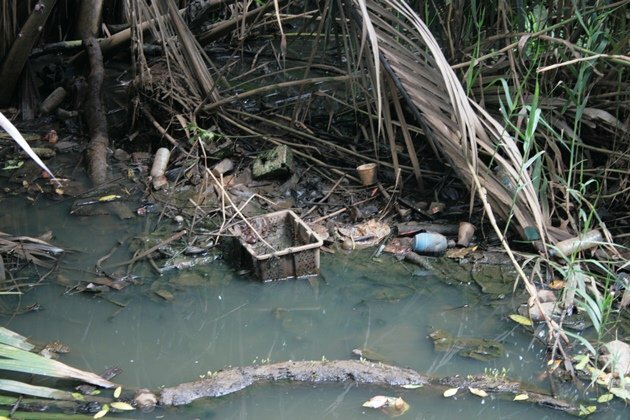 You will now understand what you are looking at when you are looking at the mud that makes up Muara Angke, and you will be able to imagine the stench that arises from the waters that the teals search for food. 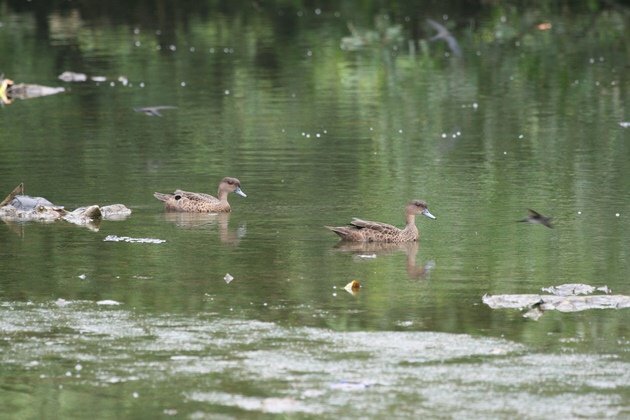 Sunda Teals, looking healthy but getting hungry. Sunda Teals, showing a feeding behaviour called “collective suicide” while a Cave Swiftlet looks on. 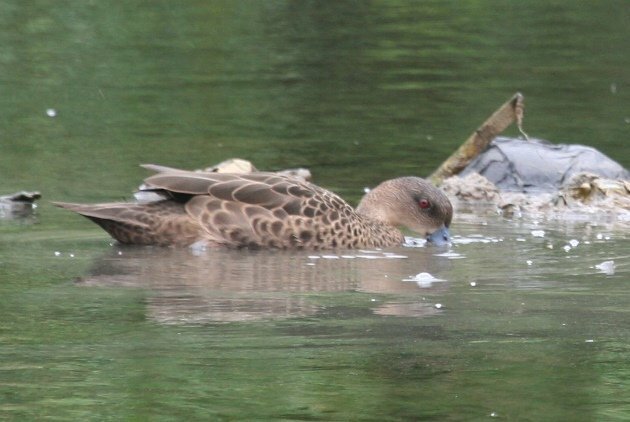 I don’t want to know what this teal is eating, you don’t want to know what this teal is eating, and I am quite certain neither does the teal itself. Muara Angke – the place where you get to scan THIS for Black Bitterns and rails. The place where you look forward to the birds, but not the birding. No, definitely not the birding. The last photo reminds me of Sankaku-ike (Triangle Pond) near the airport in Okinawa, Japan. A cesspool of a site but always great birds. The way the hotel bookings, transfer days etc worked out, I might not make it to Muara Angke. That sure is sad for the birds, but honestly … The boardwalk is apparently in a horrible state at the moment, and just the imagination of crashing through it and landing in THAT muck and water is my vision of what hell must be like.